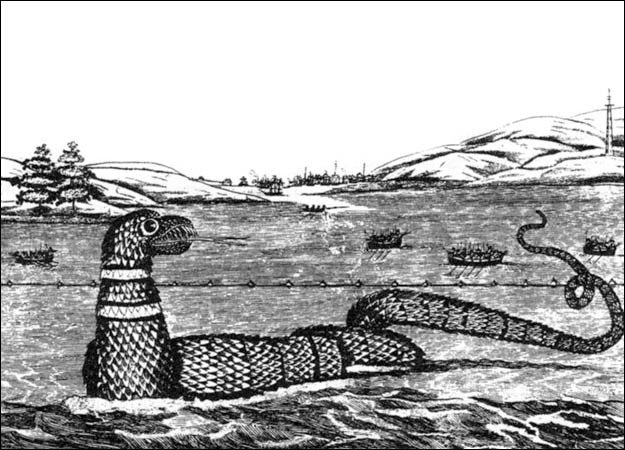 Massachusetts lays claim as being the first state to document a sea serpent sighting. An Englishman by the name of Josselyn witnessed a creature “coiled like a cable upon a rock in Cape Ann“in 1639. In August of 1817, the same area would be spotlighted when “The Gloucester Sea Serpent” was first sighted by local fisherman. The great creature was seen by locals almost every day that month. Books such as "Gloucester's Sea Serpent" by Wayne Soinim and “The Great New England Sea Serpent” by J.P. O’Neill chronicle the mass sighting. The subject of the Gloucester Sea Serpent was even the featured on an episode of Animal Planet’s “The Lost Tapes” in 2008. And in that same year, The Museum of Science held an exhibit about the legend. 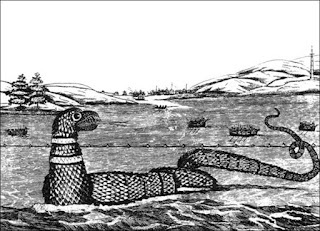 Depiction of the Great Sea Monster of Gloucester. While legends of sea monsters in the North Shore have been spotlighted in the media for years, the sea serpents of the South Shore have kept their secret locked up in the memories of the Hull residents who remember stories passed down through generations about the Sea Serpent sightings at Nantasket Beach and the surrounding area. The details of the legends lie scattered in long-forgotten newspaper articles, spanning over 100 years. The story of the sea monster that washed ashore on Mann Hill Beach in 1970 lies in the collective conscious of those who witnessed it. But to the rest of Massachusetts, it is virtually an unheard tale. For 100 years, beginning in 1830 and diminishing in the 1930s, sightings of a sea serpent in the waters of Hull made Boston Globe headlines again and again. Some witnessed reported the creature as being over 100 feet. So many sightings were reported, that the town organized a “Sea Serpent Club” in 1911 in an attempt to prove its existence. Nantasket, the beach community of Hull, was named by the Womapanoag tribe long before the town was incorporated in 1644. In Algonquin, Nantasket means “at the low tide place.” One of the first towns to be settled in America, the area of Nantasket would become one of New England’s most popular destination spots in the 1800s and well into the turn of the century. With its grand hotels, fine restaurants and sweeping ocean views, Nantasket attracted the wealthy to summer here. But the wealthy were not the only ones to appreciate the pristine waters of Nantasket, with its rising cliffs stretching toward the rocky seascape of Gun Rock and deep tidal pools at low tide; a sea serpent also summered at Nantasket with sightings reported in The Boston Globe in 1830, 1875, 1905, 1913, 1921, 1926 and 1937. Nantasket Beach, 1905, during the time of Nantasket Sea Serpent Sightings. In 1911, the town of Hull organized “A Sea Serpent Club,” whose members included town officials and other respected members of the community. The group placed a large telescope out over Green Hill and took turns being on “sea serpent watch” while Sea Serpent Club photographer, John Maguire stood by with his camera ready. 1875: Passengers and crew of the steamship Roman on a voyage from Boston to Philadelphia are shocked to see a creature that looked like a sea serpent not 400 yards from their ship. The ship’s Captain informs a passenger that the crew estimated the creature as being 120-feet long. 1877: An eyewitness writes a letter to the Editor of the Boston Globe about his remarkable experience at Nantasket. One mid afternoon in July of 1877, a man looked out from the piazza of the Waverly House to see a seafoam-spouting, 40-foot serpent-like monster beyond the beach. 1905: A fisherman and his wife see the creature. Henry Hatch described the creature: “The monster, which resembled a serpent in its sinuous movements, with great rapidity passed within 100 feet of the boat, furiously lashing the sea and leaving a wide wake in its course.” Mr. and Mrs. Hatch being highly respected members of society, the story is taken with great credence and word of the monster quickly spreads. 1911: In response to a mass of sightings, Hull residents charter a Sea Monster Club whose officers include members of the Hull Police Department. 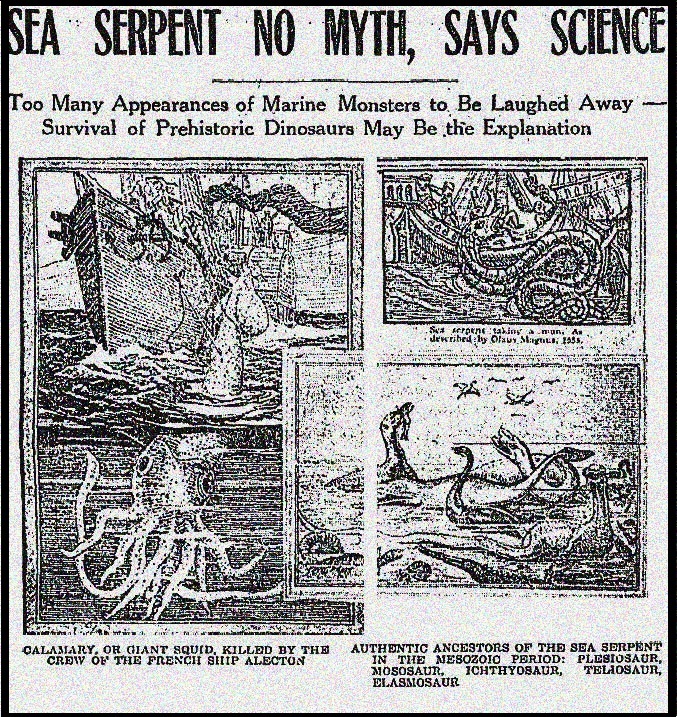 1913: Two visitors to Nantasket Beach saw what they called a sea serpent in pursuit of hunting something in the water. The two men estimated the creature’s length as being 100 feet. 1913: On November 3, 1913, three separate vehicles all pulled over when they saw what they described as being “a war at sea.” “Swimming now nearer the shore was a huge serpent, scaligerous, horrendous, devilish. The scared lookers guessed him a 50-footer and fled.” The following day, the creature is spotted by a sea captain heading toward Cape Cod Canal. Captain Macy Coffin at first mistakes the creature for a waterspout. He later estimates the creature as being 60 feet. 1921: On the evening of July 22, 1921, residents and beachgoers watch amazed as a 40-foot creature, stranded in the shoal water off Nantasket flopped and turned, trying to free itself from the shallow waters. As the tide grew higher, the creature was able to escape its peril and swim away. As mysterious as the sightings were, so is the mystery of why the sightings suddenly stopped in the 1930s. 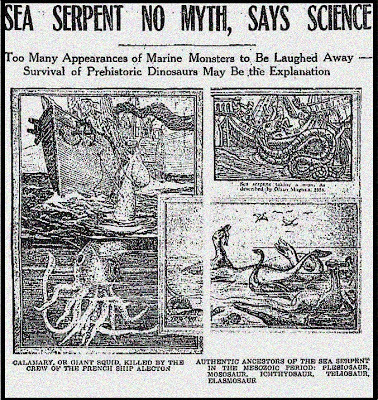 In 1948, The Globe ran this headline: “Seeing” Sea Serpents Slipping” about the subject of the dwindling sea serpent sightings from Nahant to Provincetown. “Whatever particular serpent it might have been nobody found out, but in the 200 years that followed, his snakeship made suitable showings along the cost, appearing at Cape Ann and point north, with a Cape Cod route later thrown in and Plymouth and Provincetown among ports o’call. At the height of his career in the 1800s the “most wonderful serpent” was the most wonderful indeed for he came in what approximated six delicious flavors and 57 varieties. Some observers reported his eyes were “as big as saucepans and two feet apart”—others said they were the size of dinner plates." On Sunday, November 15, 1970, hundreds flocked to Mann Hill Beach in Scituate to see a sea monster which washed ashore at about 3 p.m. In three days following, police estimated that over 10,000 curious spectators visited Mann Hill Beach to see the creature with their own eyes. Witnesses who initially saw the creature the claimed the carcass measured at least 50 feet and estimated it to weigh nearly 40 tons. Spectators gather at Mann Hill Beach to see what is left of the "sea creature." Also called to the scene was Woods Hole Oceanographic Institute Curator, Andrew Konnerth, who by the time he had arrived, had nothing more to examine than a rotting lump of mangled flesh. Spectators had been ripping away pieces of flesh from the creature as souvenirs. Edward Rowe Snow reported “People were walking up and down its back, ripping it to shreds.” Konnerth upon first examination of the carcass immediately proclaimed the creature was nothing more but a basking shark. The creature was buried on the beach but then later dug up and sent to the New England Aquarium for an attempted skeletal reconstruction. In 1971, the Aquarium released a statement that the case of the sea serpent of Scituate was officially closed. Their final conclusion that it was indeed a basking shark. But many of the thousands of witnesses on Mann Hill Beach that night were not convinced. “It had flippers. I’m no expert, but I don’t recall basking sharks have flippers. I said it before and I’ll say it again: Basking shark? What else you got?” William Conboy stated. Maureen Shea saw the creature too. “I heard the report on the radio and piled my three kids and the rest of the kids at the bus stop into my beach wagon and took them to see it before dropping them off at school. It was a great experience and gave them plenty to talk about. To me, it bore no resemblance to a basking shark." Horror In The Bridgewater Triangle: Is There A Serial Killer Among Us? 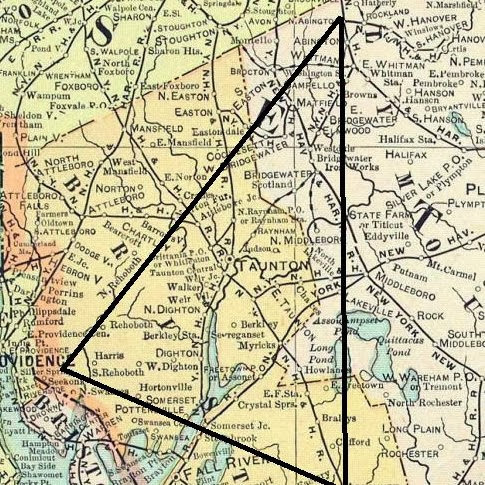 Click on the map to learn about the geography of the Bridgewater Triangle. Copyright 2017. Kristen Good. All rights reserved.. Powered by Blogger. The contents of this site are protected by copyright under international conventions and, apart from the permission stated, the reproduction, permanent storage, or retransmission of the contents of this site is prohibited without prior written consent.